People Counting System Market size valued at over USD 900 million in 2018 and will grow at a CAGR of 14% from 2019 to 2025. The rising awareness about retail analytics for understanding customer behavior & preferences in retail, hospitality, and entertainment sectors is driving the people counting system market growth. Several counting technologies offer real-time traffic measurement using hardware & software combinations such as video-based systems and sensors, are proving to be beneficial for the end-use industries. The real-time information of traffic is helpful for security & people management operations, further driving the people counting system market growth. Rapidly developing retail sector and the adoption of digitized technologies are compelling retailers to adopt advanced people counters. Several companies have manufactured retail application-specific systems that provide enhanced behaviour analytics to retailers. Technical enhancements and the integration of new technologies such as Time-of-Flight (ToF), beacons, stereo vision, among others will drive the people counting system market. With the evolution of automated systems in several industries, these systems are also gaining popularity in transportation & retail applications. Several manufacturers in the industry are introducing 2D & 3D video-based counting systems that provide accurate traffic measurement results due to the deployment of cameras and stereo vision sensors. Additionally, transportation facilities such as airports, railway stations, and other transit facilities are deploying passenger counting systems to provide increased security to passengers and manage the incoming traffic at the peak time by accommodating accurate number of passengers based on seat availability. Such factors are expected to accelerate the people counting system market growth over the forecast timespan. The Time-of-Flight (ToF) technology including sensors and cameras are gaining high popularity in the people counting system market due to the accuracy & high-speed detection benefits. Companies operating in the industry have developed various solutions that integrate the ToF technology and provide highly efficient image processing results. For instance, in June 2017, Melexis announced the launch of its new integrated ToF 3D vision solutions available for industrial, smart city, and automotive applications. Increasing focus on security aspects in the banking and retail sector is expected to increase the demand for such technologies, driving the market. In 2018, hardware components such as fixed cameras, PTZ cameras, fixed dome cameras and laser beams accounted for around 70% of the industry share and are witnessing high adoption due to the increasing demand for video-based people counting solutions. Such cameras provide accurate results and defined video quality for visitor tracking applications. 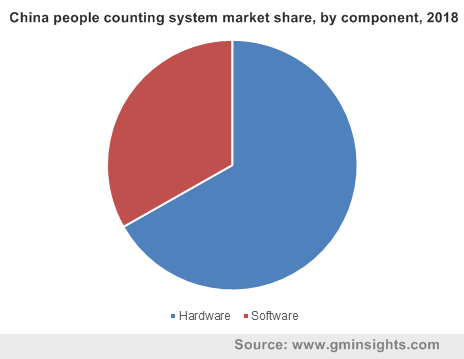 The hardware components offered by the people counting system market manufacturers are easily integrable with software and offer increased support for security parameters. Owing to the development of real-time monitoring solutions and ToF technology in cameras, the demand for hardware has also increased, further attributing to industry growth. These components find major applications in retail & entertainment sectors to accurately analyse visitor counts in a day. 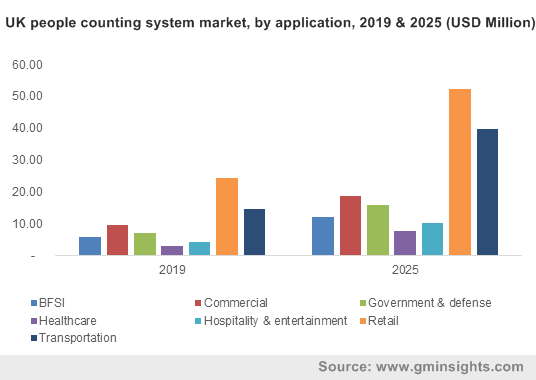 In the people counting system market, the retail sector is expected to pose a high demand due to several benefits offered by these systems and will expand at a CAGR of around 13% over the coming years. The benefits include efficient customer behaviour analysis, accurate real-time data for retailers, improved retail intelligence, and employee management, among others. The rapid development of the retail sector and the establishment of several shopping malls in the U.S., China and the UAE is a major factor driving the people counting system market growth. Moreover, the increasing focus of retailers and mall managers on providing advanced customer assistance and tracking their behaviour to identify store points that attract more customers is creating the need for people counters. Several players have developed specific retail solutions for retailers to provide real-time traffic data and reliable analytics. 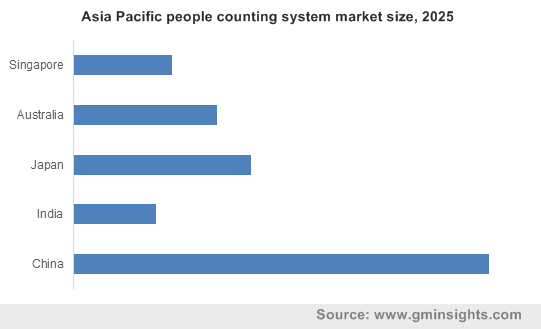 In 2018, Asia Pacific people counting system market accounted for around 25% of the industry share and is developing at a rapid pace owing to technological expansions taking place in markets such as India, China and Singapore. These countries are witnessing a high establishment of the people counting manufacturers to address the demand from transportation, retail, and government sectors. Moreover, increasing urbanization and construction of smart residential & commercial buildings are creating the demand for these solutions to monitor the number of visitors & increase the security parameters. Highly-populated countries including China and India are focusing on improving transportation facilities and providing secure transit services to citizens, resulting in high adoption and propelling the industry growth. Key players operating in the people counting system market are Countwise, Axis Communications AB, DILAX Intelcom GmbH, Eurotech, IEE S.A., FLIR Systems, Inc, ShopperTrak, Infodev Electronic Designers International, Inc., XOVIS AG, Infrared & Intelligent Sensors, InfraRed Integrated Systems Ltd., HELLA Aglaia Mobile Vision GmbH, RetailNext, Inc., Iris-GmbH and V-Count Inc., among others. The market is characterized by the presence of several companies offering both hardware & software components. These prominent players are focusing on integrating technically-advanced features in their offerings for covering major market shares. Companies are also developing application-specific products to provide accurate monitoring and analysis reports, which aid in employee allocation and marketing strategy planning. For instance, Iris-GmbH is offering solutions specifically for transportations industry that helps in passenger counting in railways, metros, and airports. The manufacturers operating in the industry market have a diversified product portfolio including products of different models and specifications. It allows the manufacturers to differentiate their product offering from the competitors and provide the customers wide range of options to select the suitable solutions based on their business requirement. Moreover, the manufacturers are partnering with the retail and transportation companies to integrate the offerings in their facilities. For instance, Eurecam is offering 2D and 3D counting sensors which it caters to retail and BFSI sectors. 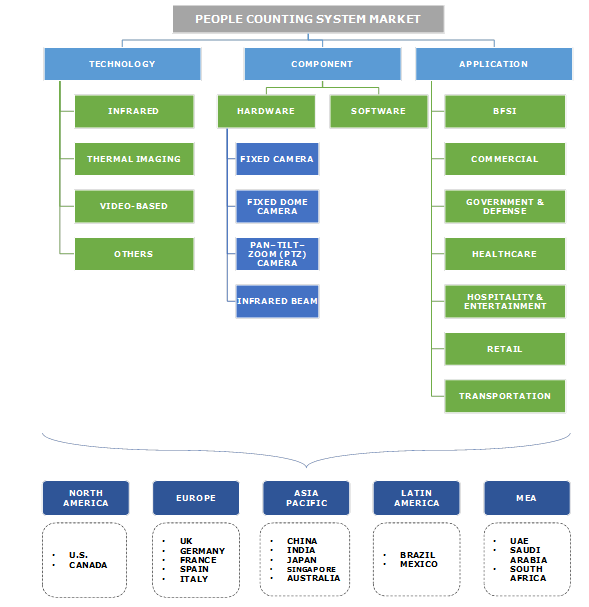 Some of the major companies operating in the people counting system market are engaged in developing innovative technologies and are offering these solutions to global markets. FLIR Systems, Inc. is a leading player, which offers a wide range of 2D and 3D sensors for retail and transportation industries.